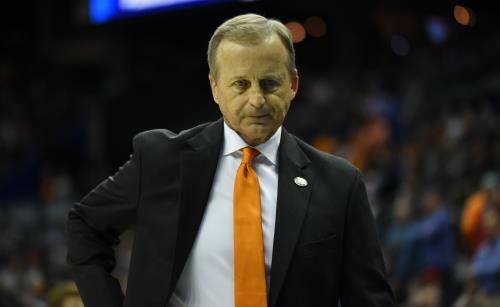 Rick Barnes’ press conference on Monday opened with acclaim rather than a question. David Teel, the president of the United States Basketball Writers Association, called in to announce that Tennessee’s coach had received the organization’s Henry Iba National Coach of the Year Award. The coaching honor followed Tennessee’s two hard-fought victories in Columbus, Ohio this weekend, which advanced the Vols to the Sweet 16 round of the NCAA tournament against Purdue on Thursday night in Louisville, Ky. It all was a far cry from where Barnes started with this program in 2015. In so doing UT has reached the Sweet 16 for the first time since 2014. Thursday’s opponent serves as a reminder of the program’s resurgence and the first glimpse of this possibility. The Vols, who were coming off a 16-16 record in 2016-17, beat then-No. 18 Purdue 78-75 in overtime last November in the Battle 4 Atlantis tournament in the Bahamas. The result, combined with a competitive 85-76 loss to eventual national champion Villanova the next day, demonstrated encouraging progress. “That tournament in general is where our guys realized we could do this and play with these teams,” Barnes said. Sunday’s 83-77 overtime victory over Iowa was a reminder of the difficulty involved with playing these teams, particularly in a postseason setting. No matter how big or capable the support group, the coach can be a lonely figure in this setting. Barnes conceded as much on Monday, saying that he was concerned about his team’s mind-set after the Vols built a 25-point lead during the first half against Iowa. “It’s a tough position to be in as a coach,” he said. Imagine then the feeling as the Hawkeyes erased UT’s advantage during the second half, hording all the momentum in the process. The Vols managed to pull themselves together and prevail. The outcome spared Barnes any sort of inquisition about forward Admiral Schofield being on the bench at the end of regulation and throughout the extra session. The storyline on Sunday was that Schofield asked to stay on the bench because he had four fouls and would be a defensive liability. He and teammate Lamonte Turner both lobbied for center Kyle Alexander to stay in the game instead. That might answer for Schofield’s absence throughout overtime. But why wasn’t he on the floor for the final play of regulation? UT was on offense then and going for the winning basket. Schofield, one of Tennessee’s top scorers, already has 19 points. But he also had missed two shots down the stretch, attempts that arguably were impulsive in nature. The coach was asked on Monday about Schofield’s absence on the aforementioned possession. “We made up our mind that’s how we were going to go with it and that’s what we did,” Barnes said. The decision was interesting. It didn’t turn out to be detrimental. In the end, there were no lonely figures. Everything worked out for everyone involved.